“The better BCM can be as a student organization, the better we can be as a campus.” These are the words of Adam Venters, the head campus minister of Baptist Collegiate Ministry (BCM), an on-campus ministry service at UA Little Rock. 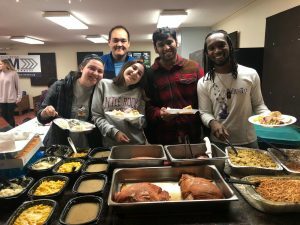 BCM students giving back to the community by providing Thanksgiving Day Meals. 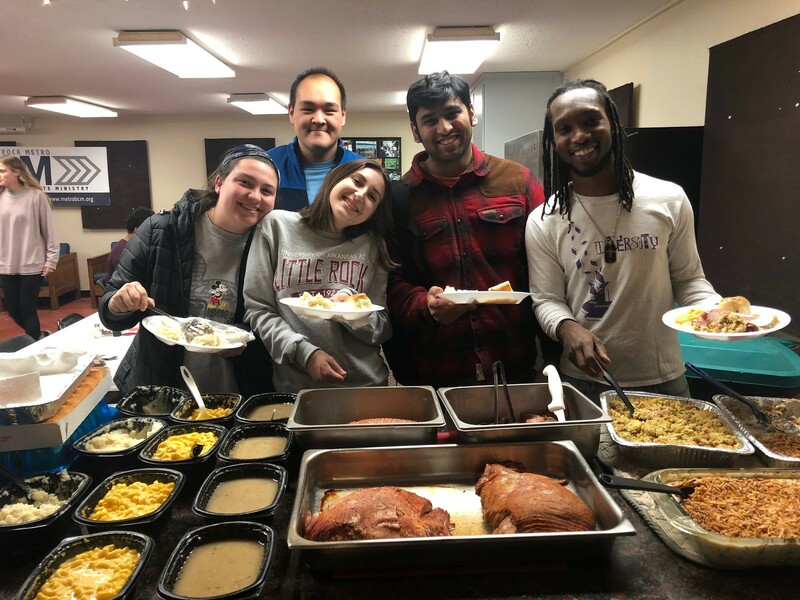 The Mission Statement of BCM is “Grow, Connect, and Serve” not only students on campus but also the local community. BCM started in 1974 and it is safe to say that they have seen plenty of changes, not only in our community but also on the campus as well. 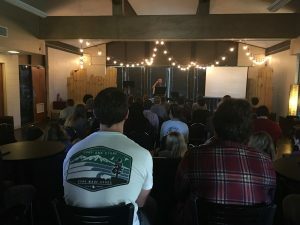 BCM is a registered student organization on campus but they are supported by over one hundred local Southern Baptist Churches in the city of Little Rock. These churches both support BCM financially and partner with them to give back in the community. BCM holds a Tuesday night Bible service, which is usually sponsored by a local congregation that provides the food for that night. BCM also hosts a family group Bible study that is open to all that want to attend. BCM strives to create a family atmosphere and refers to mission trips, retreats, or any kind of service trips as “vacations.” BCM recently held a competition called Penny Wars. This competition was between the BCM Boys and the BCM Girls to see who could raise the most money to be donated to the Trinity Community Center is Holly Grove, New Orleans. In total, both teams raised a combined two-hundred dollars, but the guys raised less money and so they had to take a slime bath. BCM during one of their two Tuesday Night Bible Studies. In addition to activities to engage students on campus, BCM is also active in the local community. In the month of January alone, Head Minister Adam reports that BCM students had a combined 150 hours of community service helping high school students. This service ranges from speaking with them about how to navigate their way when coming to college, to helping them with homework, to just sitting down and reading with them. They also participated in a community clean up day in North Little Rock and are doing the same in April for Little Rock. In speaking about these service activities, Minister Venters says, “Problems in the world are real. Once we can reach across the divide, we can create conversations that can allow us to grow together.” There are a lot of boundaries that still need to be knocked down in today’s world. With the help of BCM and other groups with similar missions, leadership, and work ethic, those barriers can begin to fall. For more information about Baptist Collegiate Ministry, or to contribute to their service projects, visit their Instagram page at metro_bcm or you can reach out to Head Minister Adam Venters at aventers@absc.org.